Grand Tactic game designed by Mark Mokszycki on the battles that pitched the 49th Infantry Division near Caen against the 12th SS Panzer Division "Hitlerjugend" (Hitler Youth) and Panzer Lehr—elite panzergrenadier units before Operation Epsom. Normandy 1944. 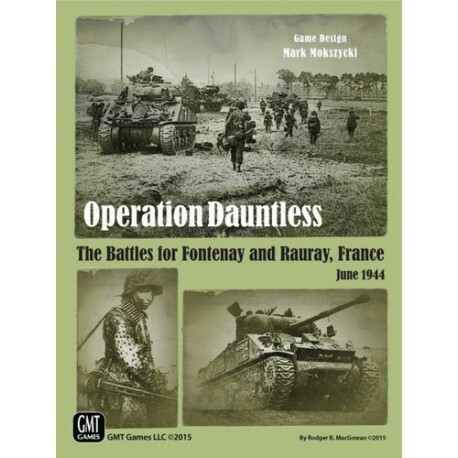 Operation Dauntless: The Battles for Fontenay and Rauray, France, June 1944, is a wargame that covers the actions of the British 49th Infantry Division (a.k.a "The Polar Bears") near Caen during Operation Martlet (called Operation Dauntless by the British at the time of the battle). Opposing these lads are elements of the 12th SS Panzer Division "Hitlerjugend" (Hitler Youth) and Panzer Lehr—elite panzergrenadier units. The goal of the British division is to seize the town of Fontenay, then press onward to secure the high ground near Rauray in time for the impending Operation Epsom, to be launched the next morning. The game by designer Mark Mokszycki uses the same system as Red Winter, his game on the Battle of Tolvajärvi from the Russo-Finnish Winter War of 1939. Scale is grand tactical: 90 minutes per game turn, 425 yards per hex, and mostly company sized infantry units with platoon sized armor units. Gone are the Winter War specific rules such as ski movement and night raids, and in their place we have a more detailed armor/anti-tank subsystem. There are lots of tanks on both sides in this one! 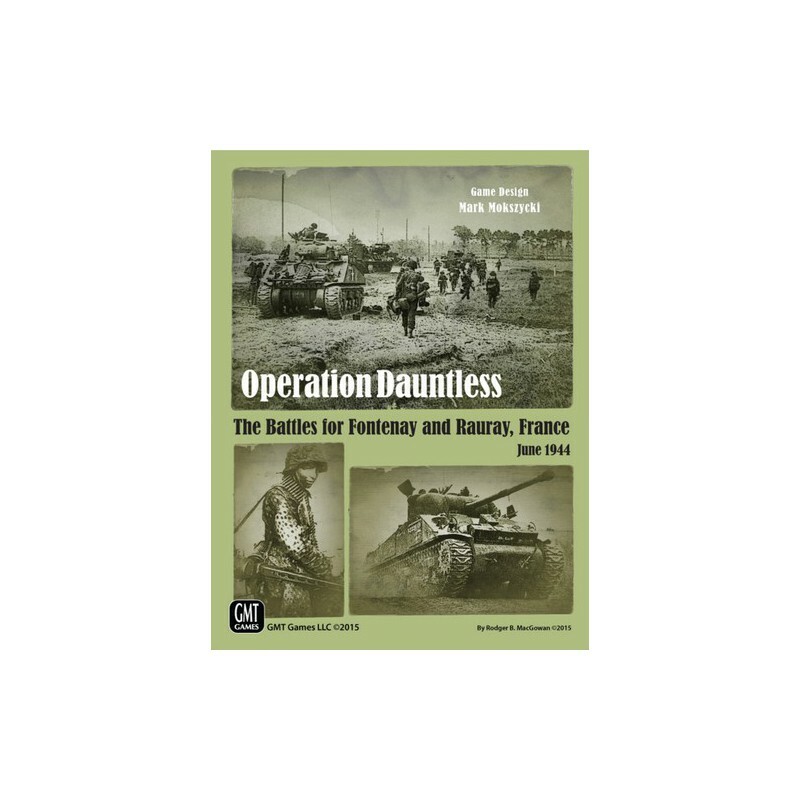 Rules for Operation Dauntless include the 12th SS Fanatical Defense Table, British sabot ammo, tank destroyers, self-propelled infantry guns and artillery, combat engineers, troop transport, British air strikes, German nuisance raids (night bombings), infantry anti-tank weapons, German ammo shortage, and abstracted effects of the immense British opening barrage by 650 guns. Terrain is a mixture of corn and wheat fields, orchards, woods, heavy and light bocage, and small stone farm houses and villages. The Germans begin the game dug in, and they may place a limited number of fortifications during setup. The game includes a multi-day campaign as well as several shorter scenarios. The Germans are on the defensive overall, but they are armed to the teeth with many powerful panzer formations—including Panzer IVs, Panthers, and Tigers—and will find themselves able to counterattack frequently and effectively. Some of the shorter scenarios feature the Germans on the offensive to recapture lost ground. The game was designed for two players, but works very well solitaire.